Marshall Electronics Optical Division - 420 TV Line CCD DSP B/W Camera for the automobile, industrial video, covert security, and surveillance markets. 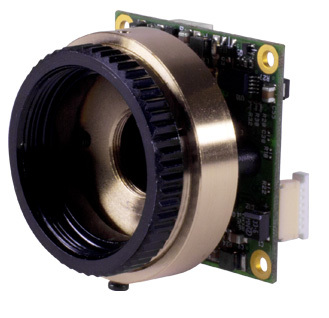 V-1217-C/CS is a special 1/3 CCD sensor single board B&W camera designed for OEM, industrial process, test and measurement, law enforcement, military, medical, scientific and security applications. 420 TV Line DSP CCD sensor, low light 0.03 lux F1.2 performance provides exceptional Near IR imaging. Great performance for low light machine vision, medical, scientific, and security applications, RoHS compliant. C/CS lens mount for a large variety of lens options for any application, [lens not included]. Miniature lens version model V-1217-PCB-3.7 also available. Features compact 32mm X 32mm board size, Auto Gain Control, Mirror On/Off, 2X Digital Zoom, Electronic Shutter, low 12 VDC 1.2W power input.